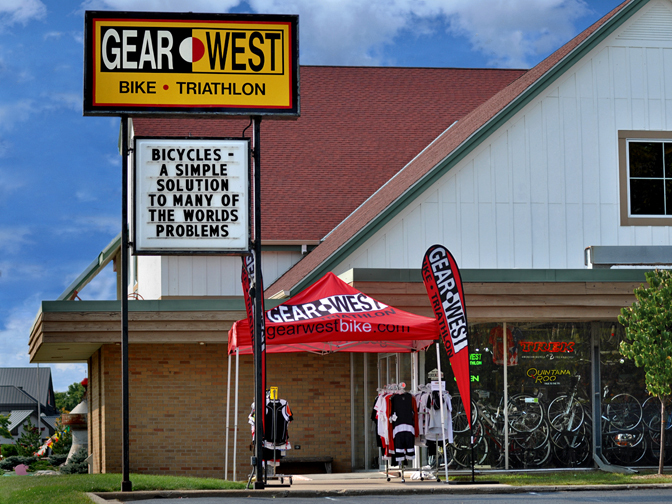 Gear West Bike & Triathlon has been a part of the Long Lake community since we opened our doors in 1993. Not only have we been involved on many levels locally, we have also been involved throughout the Midwest in the Triathlon community. We are a unique business because it is almost as if we have two sides of our business inside the one bike shop. To many in the community we are the local bike shop. We have bikes for the whole family. From 12” bikes and BMX bikes to the Hybrids and Mountain bikes for the big “kids”. It is surprising to many of the locals that we have so many bikes specifically designed for the road. But that is the other “half” of our business, triathlon. In 1995 Gear West Bike & Tri started to do whatever we could to grow the triathlon scene in Minnesota. There were only a dozen or so triathlons and duathlons in 1995 and 5 of those shut down before the 1996 season. So we worked with any race that was still around by promoting, assisting, supporting, and of course attending. Today there are more than 50 multisport races in Minnesota. We are not saying GWB&T is solely responsible for all the races but we continue to work with as many races as we can. This year we will offer financial support to 16 races as well as technical, logistical, and promotional support to any that need it. Run a fair and honest business that is based on strong values that will leave everyone feeling that they are treated fairly. Offer the opportunity for all employees to earn a fair living and livable wage while working in a positive environment with the opportunities to excel. Give back to the community in which we are involved. This includes our immediate community of Long Lake/Orono/Medina, as well as the Triathlon community throughout the Midwest. We are proud of who we are as a business and as individuals. When you visit us I am proud to say you will find a positive environment where we are proud to be each day. A place that is both casual and professional. If you have not been here in a while you will still see the same faces as most of the people have been here 5 or more years.